Quick Study: Boris Minaev’s career in letters weaves together seemingly disparate threads: he edits a journal for men that focuses on reading material, and his books include a biography of Boris Yeltsin and collections of stories about a Russian boy. The Minaev File: Journalist, fiction writer, and editor Boris Minaev is probably best known among Russian readers for two very different works: a 2010 biography of Boris Yeltsin and a collection of short stories about a boy named Lyova that was first published in book form in 2001. 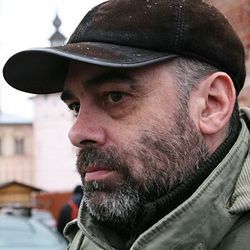 Minaev is head editor of the magazine Medved (Bear), which calls itself “a men’s journal for reading.” Minaev fulfilled a childhood dream by becoming a journalist; he has worked for several other publications, including the magazine Ogonyok and the newspaper Komsomolskaya pravda. Psssst………: Minaev began writing as a teenager, composing stories and notes about happenings in the yard around his building. Minaev’s Places: Moscow: born, raised, and educated, studying in Moscow State University’s journalism department. Minaev Recommends: In a 2002 interview Minaev said he had no current favorite books but he listed writers that affected him as a student: Fyodor Dostoevsky, William Faulkner, Anton Chekhov, Ivan Bunin, Yury Trifonov, Kurt Vonnegut, Gabriel Garcia Márquez, and Mikhail Bulgakov. Among contemporary writers, his 2002 favorites included Boris Akunin, Viktor Pelevin, and Liudmila Ulitskaya. Named an honored cultural figure of the Russian Federation in 1999.